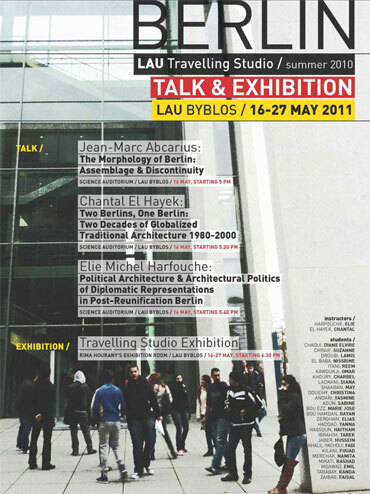 The 2010 LAU Traveling Studio took place in Germany’s capital city and one of its 16 states: Berlin. Over 10 days, 28 participants from LAU — including two instructors — followed a packed itinerary designed to immerse them in the outstanding richness of the city’s architectural environments, spanning the academic and professional contexts to the built forms themselves. The focal theme was contemporary architecture. This was explored through exposure to ideas developed in key universities, work produced within major architectural practices, and the buildings and schemes that have come to fruition in the city. The presentations and exhibition will present and put for discussion the findings and ideas that the Studio experienced before, during and after the visit to Berlin. Science Auditorium, May 16, 5:00 p.m.
Science Auditorium, May 16, 5:20 p.m.
Science Auditorium, May 16, 5:40 p.m.
Exhibition: Rima Hourani Exhibition Hall, May 16–27, starting 6:30 p.m.